Check out this fun radio controlled helicopter, the Black Stealth 3-Channel R/C Helicopter. The secret of the incredible stability of the Black Stealth 3-Channel R/C Helicopter comes down to the torque control afforded by the dual rotor design. A traditional helicopter with only one rotor generates massive torque when the top blade spins. Normally this would cause the copter to spin out of control, but the rotor on the tail is designed to offset this torque. Therefore piloting a traditional helicopter involves constantly adjusting the tail speed whenever you increase the speed of the top rotor… difficult and time consuming to learn. The Firefly Mini R/C Helicopter has dual rotors on the top which spin in opposite directions. These opposite spinning blades cancel out uncontrolled torque making for incredibly stable flight. For forward and reverse motion the tail rotor then blows up or down, pitching the copter forward or backward and causing it to move in that direction. It’s a great control system and a pleasure to fly. 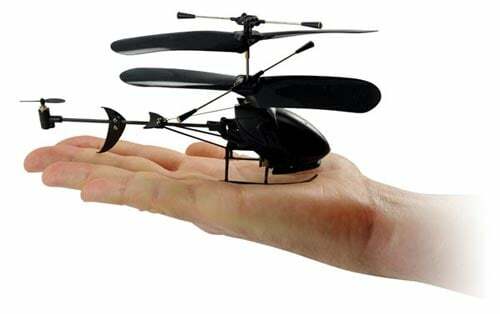 The Black Stealth 3- Channel R/C Helicopter is available to buy online for $29.99 from ThinkGeek.